Stumbled on this searching for a gum syrup recipe, and also am a modernist dabbler, so I’d love to try this recipe. However, I’ve read it a dozen times and am still not sure where to add the blended gum water in the process? 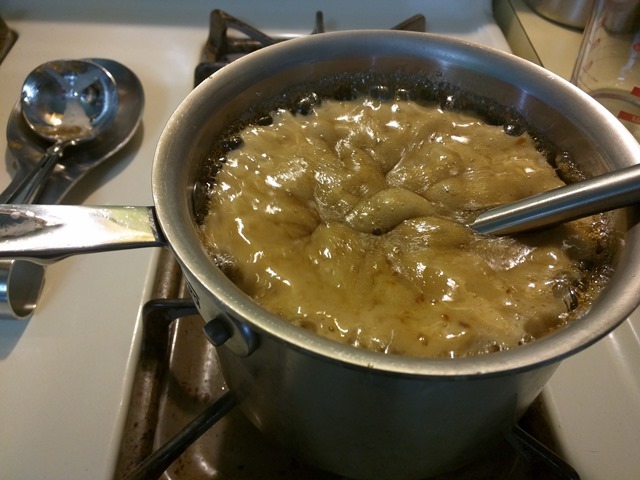 Do I add the blended gum water to the sugar and heat it all to boiling, or do I add it at some point during/after I’ve heated the sugar by itself to a melted boil? Any clarity you could provide would be met with gratitude. Thanks again, looks like some other great things to try out here as well. Looking forward to making your recipe! I didn’t write that well! Put it in with the sugar in step 2. That’s why it looked all napalmy. Also, after letting it cool and sit for a bit, I’d halve the gum next time. It was just too thick to handle, and when it went into a cold cocktail it just formed a sludge at the bottom of the shaker. Thanks for the quick and clarity! Funny thing, I flipped a coin and added it when I should have it turns out, and my end result was EXACTLY what happened when I made a whiskey sour! :). It ended up being the most delicious whiskey sour I’ve ever had, bar none! I will halve the gum as well the next time, but I must say, in a Boston shaker with the ingredients, some ice, and a brisk 15-20 seconds I made paradise with exactly what we made using your recipe. A real winner for sure! Thank you again for sharing your recipe and data getting there. It was a fun interesting read, worthwhile endeavor beyond a doubt, and a great jumping off point to look deeper into this gomme syrup thing (Pismo Fizz, etc). Yeah I loved the result too when I got it to dissolve! I think part of the problem I had may have been storing it in my fridge. Had I kept it at room temp, as it was when I first used it, it probably would have been better. Let me know if you halve it and try. Curious to see if you get a comparable mouthfeel with greater ease of use! By the way it occurs to me, you might be able to make this without cooking at all by just dispersing the gum and sugar into the water in the blender. Even 2:1 simple can be done without heat if you just shake and wait, shake and wait. Time to try this!!!! (1) I mixed the dry arabic powder and sugar together first, to help keep the gum powder dispersed. (2) With the sugar and gum mixed, it worked fine to add the mixture to the vortex by gently shaking the mixture out of a spoon using a side to side hand motion. 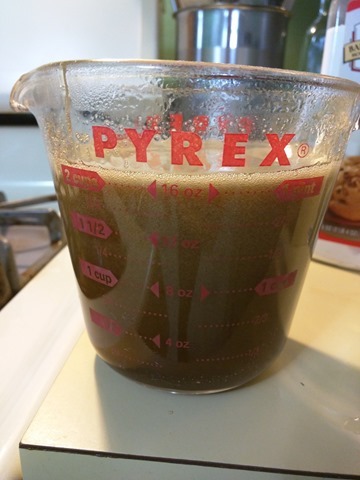 (3) I ran the blender (a Vitamix clone) until the syrup was noticeably warm. At that point the sugar was completely dissolved. The sugar might have dissolved a lot earlier, though! 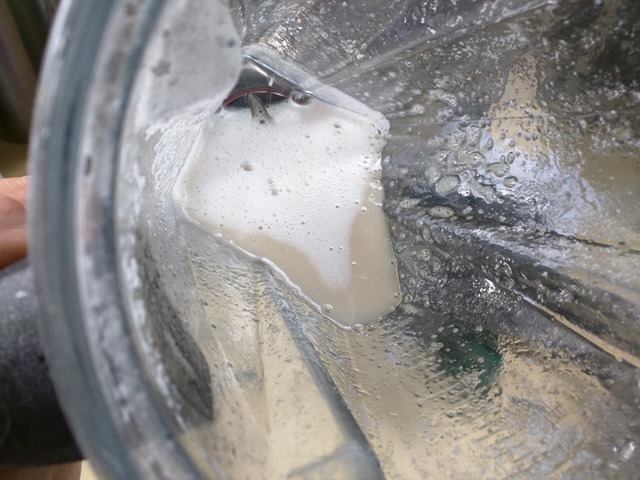 (4) Even though the mixture was dissolved, it was quite viscous and the air bubbles were taking a long time to separate. I ended up heating it in a water bath up to about 85° C and keeping it there until the foam had separated out. I had the stuff in a loosely capped bottle at that point, which was a mistake since there was no way to get at the foam. 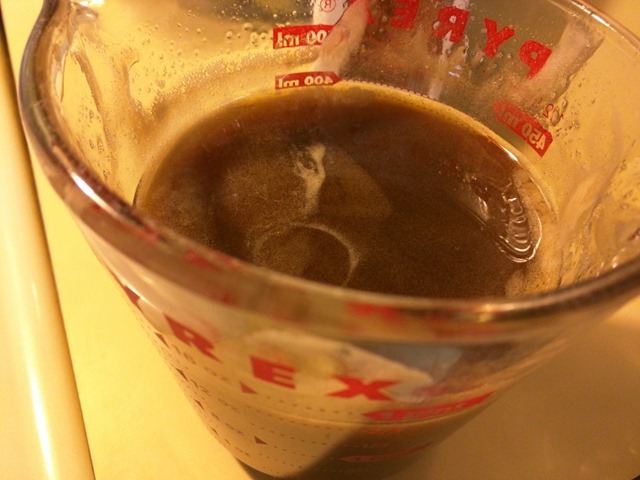 I ended up transferring it to a measuring cup, skimming, and then back into the bottle. Using a mixing glass from the start might have worked better. (5) Another advantage of heating up the mixture is that it sterilizes it, which (I’ve heard) lets it keep longer in the fridge. I didn’t go through a full canning process, so it wouldn’t be safe to keep it for a long time at room temperature. I tried this and the ingredients combine beautifully. I used a 3-2 instead of a 2-1 sugar ratio. I didn’t read about using half the gum until I’d actually made the stuff, so I diluted some of mine with a 3-2 simple syrup. The diluted version is definitely easier to work with, but the full strength version works fine as long as you treat it like sugar in an old fashioned instead of “simple syrup”. Just add it to a small amount of liquid and stir util mixed. The thicker gomme syrup adds a lovely, silky, feel to the drinks.